Garlic from my garden was processed for lacto fermenting. The bulbs were split and the cloves placed in a tortilla press to remove the skins and to crush slightly.They were placed in a liter jar and the contents were covered with a brine solution of one heaping tablespoon, 20 grams\liter of water, of salt and bottled, chlorine free,water. A standard jar plastic lid was placed hollow side up to keep the jar contents immersed in the brine solution. A screw cap was then installed finger tight to allow the CO2 gas to escape during the fermentation process. This is my first attempt in processing garlic in this manner. Picture showing the fermenting after about two weeks. From the Internet. Garlic is an excellent source of vitamin B6, plus a beneficial source of manganese, selenium, and vitamin C. It also is a good source of minerals, which include phosphorous, calcium, potassium, iron, and copper. 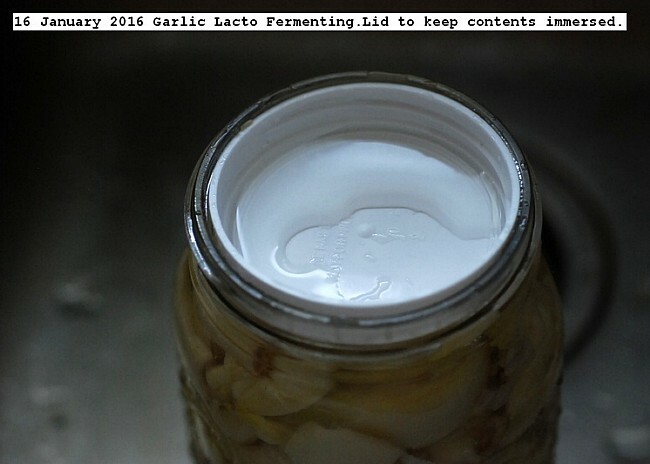 Lacto-fermenting garlic increases its medicinal value and at the same time mellows out the sharp heat that you get when eating a raw clove.Garlic is a natural antibacterial and antiviral fighter.You can give a whole clove of lacto-fermented garlic to a child and they will love it. To me it’s like eating candy, that is how mellowed out it can get. Use it medicinally and in your cooking just like you would a fresh peeled clove, minced up. The timeline for fermenting is 1 month to 2 months. 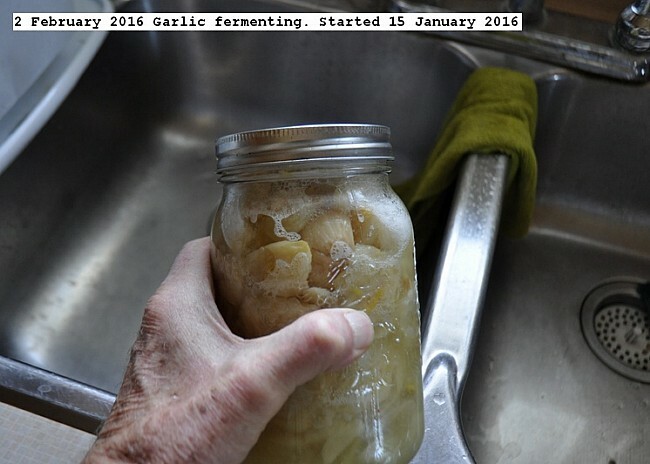 This entry was posted in Uncategorized and tagged Garlic Lacto Fermenting. Bookmark the permalink.